Since 1909 Eli Belovitch, Belstaff’s Founder, used his experience in weatherproofing and fabric development to create the now signature Belstaff wax cotton. Belstaff has continued to innovate materials throughout its 93 year history in aviation, military, naval, mountaineering and moto. 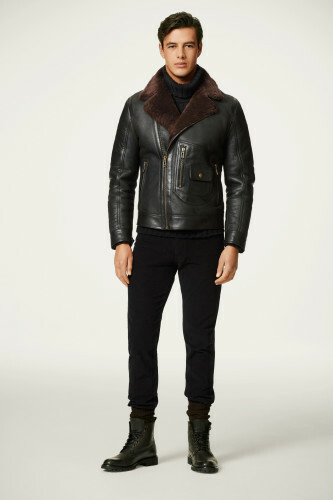 The launch of the Origins collection showcases Belstaff’s constant quest for high performance functional protection. Launching 1st February, 2018 Origins represents modern season-less outerwear with new fabrications exclusive to Belstaff. The all season Tri-layer two-way stretch fabric has unique performance properties and is waterproof, windproof, breathable, moisture-wicking, quick drying and UV protective. The ultralight stretch nylon is water repellent, windproof and breathable. This collection is designed for movement, lightweight, durable and can be worn in all climates, impermeable to the elements. Styles include the Tri-layer Trialmaster Evo, showcasing the evolution of the Belstaff four-pocket signature silhouette, with 2018 celebrating 70 years since the original Trialmaster launch. Named after the challenging Scottish Six Day Trials in the UK, the style was quickly adopted by the moto community and continues to be a best seller today. The legacy of the jacket has been updated through the Origins concept with laser cutting techniques on pockets and rubberised snaps for a modern look. Bonded seams, reflective strips and waterproof zips, which add a graphic element to the heritage silhouette, complement this. The Tri-Layer Slipstream style also offers total waterproofing, with bonded seams and waterproof zips along with a back-concealed breathable vent. Both styles have internal smartphone friendly pockets and are available in Black, Electric Blue, Fog Grey and Slate Green. The Vapour silhouette uses technically advanced ultralight stretch nylon, providing unparalleled mobility and comfort in active conditions whilst remaining water repellent. The elasticated waist adjuster, reflective details, laser cut precision, front center pocket and bonded peaked hood design is available in a new colourway of Bright Tamarind, Admiral Blue and Slate Green. The Compass provides a technical soft shell, which is quick drying, UV protective and lightweight. For women the Tri-layer Venturer sees a technical update on the four-pocket jacket with complete waterproof protection. The bold orange concealed hood, reflective strips and internal drawstring waist provides a chic alternative to the classic raincoat or trench. The Meridian, a shorter version, continues the lightweight offering with snap collar detail, internal drawstring waist for added femininity and concealed zip. This is available in Dark Parchment, Black and Fog Grey. The Sphere jacket in ultralight stretch nylon has a gathered collar, wrist and waistline to create a modern silhouette, with added hood for further weather proofing. The Velocity, a shorter version, has the same fabric properties, perforated wrist detailing and concealed pockets, both available in Admiral Blue and Ash Rose. The full women’s offering has signature black rubberised hardware and updated Belstaff rubberised branding.